During the Civil War, James Madison Bowler and Elizabeth Caleff Bowler courted, married, became parents, and bought a farm. They attended dances, talked politics, and confided their deepest fears. 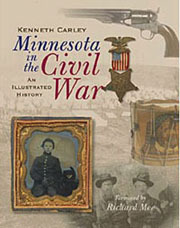 However due to the war, they went to — and through — many of these events separately, sharing them with each other through hundreds of letters they wrote between 1861-65, the years that James fought with the Third Minnesota Volunteer Regiment. The young couple soon realized war has a way of altering idealism. What had started out as an exciting adventure — a new town, new state, new marriage, and his strong love of country (a feeling shared by Lizzie who proclaimed “go if you think it your duty”) — began to fade as separation and the war began to wear down both James and Lizzie. As their commitment to the war and to each other began to wane, the letters became more than love letters. The letters began to show their fears for, and frustration with, each other. Thanks to painstaking research more than a century later by U of MN grad student, Andrea R. Foroughi, the teacher Bowler and one of his students, Lizzie Caleff, unintentionally became two of that era’s best historians. Their letters, and this book which also contains 10 b&w photos, now provide readers with a window into one couple’s experiences during the Civil War.